If makeup is designed to make you look your best, then who says your makeup bag shouldn't also look great too? This 3 Piece Cosmetic Bag Set - Pink/Chocolate Floral comes with 3 smaller makeup bags that all feature an appealing floral pattern. No, flowers on makeup bags and other dorm supplies for girls is nothing new. However, any girl would choose flowers over plain black cosmetic bags for college! These college cosmetic bags are just what you'll need when you're running off to the communal bathroom to do your makeup. Since most makeup containers are quite small, there's no point in some giant-size college makeup bag taking up all that space in your dorm room. By having more bags for your cosmetics, you'll actually be more organized. You can put certain cosmetics in the three different bags, and you'll quickly start to remember what's kept where. Instead of shuffling through one big cosmetic case, these three smaller bags can really be a time saver. A good cosmetic case for college is probably on every girl's college shopping list, but try these three smaller cases to change up and even hasten that morning routine. 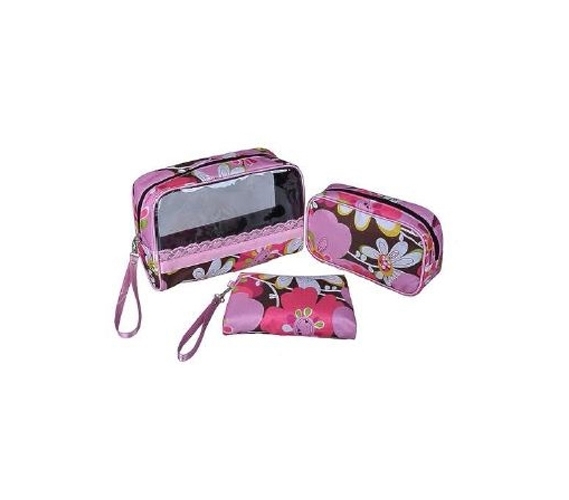 Since these makeup bags are smaller, you can easily fit your essential makeup supplies in one of the mini-bags and place it your purse for a quick touchup between classes.